Carling's Ale I've Found Out Ad 1950 This is an August 21, 1950 advertisement. It is a nice color ad for Brewing Corp of America of Cleveland, makers of Carling's Ale. It pictures Peter Perkins, Polo Star and Wesley L Mason, New Photographer from Hartford Conn and the caption reads, I've found out. They are talking about the great taste of Carlings Ale. In mint condition. This photo is taken through plastic and may show wrinkles or crookedness that is not in the ad. This magazine tear sheet measures 10 1/4"" wide by 13 3/4"" tall. 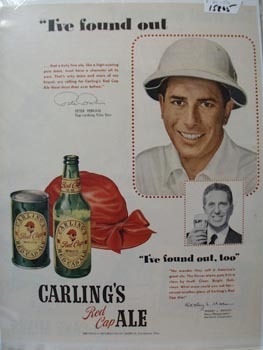 Items Similar To "Carling's Ale I've Found Out Ad 1950"